The MTAC is an inside the waistband (IWB) Kydex and leather hybrid holster designed for concealed carry. Created to be worn behind the hip at 4:00 or 5:00, this holster offers the best in comfort and speed for concealed carry use. The MTAC attaches to the belt by two clips mounted to the leather tabs on either side of the holster. These mounting clips distribute the weight of the loaded pistol while holding securely to the belt. A shirt may be tucked in over the gun and holster providing complete concealment. The clips will also allow for ride depth or cant adjustment by using the different mounting holes. The MTAC can be purchased with either 1.5” Black Standard Clips or 1.5” Black C-Clips. To purchase other clips styles, sizes or colors, please visit our Holster Parts and Hardware or the clip pages below. Additional clips are only $4.99 each. The Slide holster option allows the user to use one holster for similar guns of different lengths (such as Glock 9mm, .40, and .357). The Slide is typically slightly longer than the shortest gun of the series, and left open so that longer guns may ‘slide’ through the end of the holster. 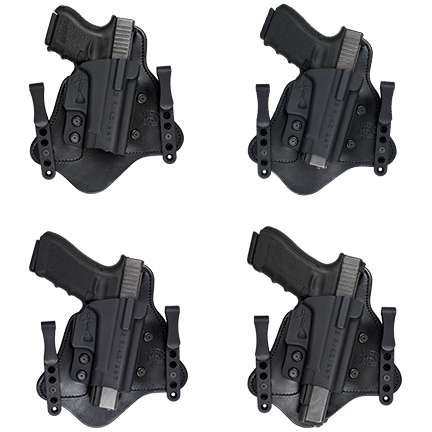 Comp-Tac fit checks EVERY holster with the actual make and model firearm ordered. As a result, the leather backing may show slight wear marks or scratches from the fit process. Returns/ Exchanges: Due to the cosmetic vulnerability of leather, Comp-Tac reserves the right to charge a 20% restocking fee on any leather returns or exchanges that are deemed to be damaged or abused. I've been a huge fan of Comp-Tac holsters for years and my latest purchase lives up to the standards I've come to expect from them. It's beautiful, well built, comfortable and secure, everything I need in a holster. I bought this holster for my S&W Shield 45 and Sig Sauer 229 40 cal. It's very comfortable to wear 14 plus hours per day. Highly recommended. This is the second holster I’ve purchased from Comp-Tac. I own holsters from the major labels that get the most print in mags and they don’t come close to the quality, comfort and fit of my Comp-Tacs. I will only be buying this brand from now on. The "wings" of leather where the clips connect, for me could use to be extended just a bit to give the "paddle" more flex around my hip. Other than that I find it to be perfect, I'm sure after I use the product for a while and it breaks in I'll get the flexibility I'm missing now. Fantastic holster, very comfortable.. have 4 of these holsters. Just wish you made this holster for the FNX45 & CZ97. This holster is perfect for my Sig P320 Compact 40MM. It has substantial rigidity to hold the weight securely and the design is perfect for performing a clean draw. It is very comfortable for all day carry. This is my second MTAC Holster. This holster is just great! Super comfortable, easy to adjust and durable as hell! You are missing out!